Munich, mostly at night, is full of street musicians whose performances are not as spontaneous as they may seem but are, in fact, quite institutionalized. Every morning, one needs to apply for a permission at the city administration. Ari Benjamin Meyers’ ‘Staatsorchester’ (State Orchestra) is an invitation for the dispersed street musicians to come together to establish an informal ensemble. Ari Benjamin Meyers questions musical high culture along with the rules. Meyers moves the focus from the orchestra pit to the streets and back to the center of power, inside Munich’s New Town Hall, the very building where the musicians have to apply for their license to perform. His composition, written specially for the occasion, becomes part of the musicians’ repertoire and is rehearsed on the streets of Munich before its world premiere. 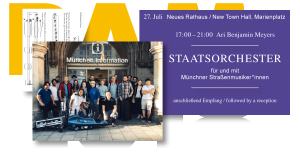 This means that over several weeks prior to the closing performance in the Grand Assembly Room of Munich’s New Town Hall, fragments of the composition will be heard as an overture to a work in progress, and one week before the Grande Finale the musicians will publicly rehearse at the MaximiliansForum (23–26 July, 3-6pm). ‘Staatsorchester’ questions the divisions between stage and audience, institution and street life, professional and amateur, and music in art, art in music. It also seeks to follow these time-based, ephemeral, invisible, and simultaneously transgressive sounds by using them to reimagine the distinction between interior and exterior, private and public spaces. In this context, dissonance constitutes not a lack of harmony, but a radical democratic practice in support of political openness. 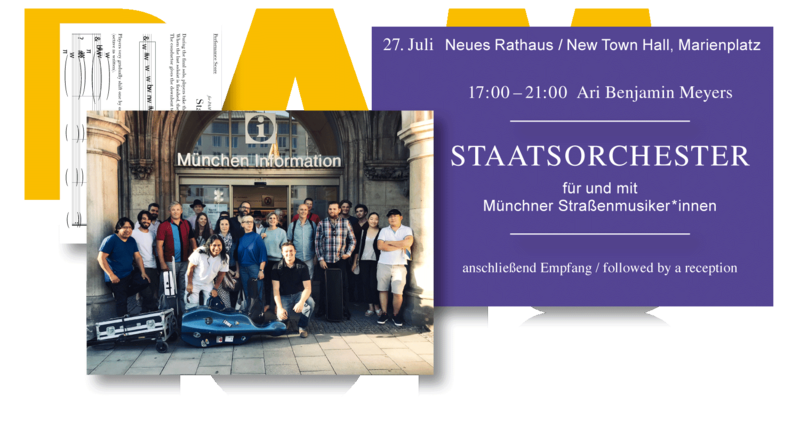 With ‘Staatsorchester’ PAM – Game Changers ends where it all began, in Munich’s New Town Hall on Marienplatz: here the City Council unanimously voted for a second edition of the project back in 2016; here we held the press conference announcing the program; and here (and at the ground-floor offices of the Stadtinformation, where street musicians must apply for a daily permit to play) they will now come together to form a ‘Staatsorchester’ – a unique informal ensemble for a 4-hour performative music installation. This world premiere will be followed by a reception on the second floor of the New Town Hall. We are looking forward to raising our glasses to the artists, our partners, our public, and all of you Munichers and non-Munichers who have made PAM 2018 a meaningful and huge success!